Star was trotting down a hallway. "You can't fix things. "She said it without turning back.Se approached a dead end,and walked through the wall.They emerged in a room,lined with machines.Ones you would see in a hospital...but also ones from a factory.A large metal capsule stood in the center of the room,open and empty.As the two stood there,they began to hear crashes in the distance,and yelling.As it got closer,they could make out some of the words. "Hurry!We need more ponies,more restraints,anything!" "She's breaking it!" "Get out of the way!" Star stared,unmoving, at the large metal door on the side of the wall. TU: Yeah this realy reminds me of the day my brother become Herobrien. It was in my lab and there's machines everywhere down there and he escaped while saying the new battle had begun. Though it looks like this is the day that unicorn completely changed and escaped out into the world to cause chaos across equestria. She glared at him,irritated. "Don''t.Say,anything about him.Not until you see what he did." She turned to look as the metal door crashed open.Dozens of ponies ran in,each one the same black coat and crimson eyes as the unicorn that had tormented her. They were in a panic, and rushed all over the room,turning on machines.And then more of them came in,dragging a familiar pony with them.Star snarled at the ponies surrounding her, struggling as much as she could with the couple dozen chains weighing her down.Many of the ponies were already injured,not expecting the sedatives they shot her with to wear off so fast.They dragged her to the capsule,shoving her inside and slamming the door.She raised a hoof to touch the glass,still glaring at them,before sitting down on the casule floor.She raised an eyebrow at the terrified ponies. "So.Where is he?And what is his plan this time?" She snorted,amused. "The last couple of times he caught me didn't work out so well,did it?" TU: So this is like one of his attempts to capture you? Star glanced at him,then back at the Star in the capsule. "She'll answer your question." Star stretched,not worried,even though she was trapped in the capsule.She looked around,bored. "So...when is he coming?He usually wants to get it over with as soon as possible." She frowned. "Although this is the first time in Equestria.How long has it been?I don't even remember anymore.Even if you don't count all the years I was...asleep.Or dead. "She sighed,and stood up.As she did,her ears flicked, and her frown deepened. "So you finally decided to show up, 'eh?What do you want this time?" 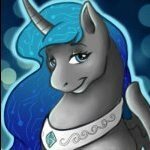 It seemed she was talking to nothing,until the ponies reacted.Each one of them melted into a black fabric looking liquid.The liquid gathered at the center of the room,and from it rose a alicorn. Every aspect of him was black,and it looked like he was made of shadows.He opened his eyes,and they glowed blood red. "Hello again Star,my dear." TU: That alicorn literally somehow feels exactly like Herobrien though he's probably a clone of Herobrien's personality. "No,he is not a clone! "Star(Normal Star) frowned at Techno. Star glared at him from behind the glass.He moved towards the capsule,and although she winced,she stood still.He smirked at her. "What?No 'hello,how are you' ?" She narrowed her eyes at him. "Stop wasting time.Why did you drag me here?" He turned,walking away from the capsule and toward a control panel. "Oh,it's simple my dear." He glanced at her,smiling. "I know how to finally beat you." She snorted in disbelief. "You do know you say that every time right?" He reached the control panel and stopped,stroking the side of it with one hoof. "Oh I know.But this time..." He pressed a button, and a screen flickered to life on the back of the panel,against the wall.It showed a hallway,and for a moment nothing happened.And then a black,hooded unicorn ran down the hallway.The alicorn smiled cruelly. "...I have a trump card." TU: And now he's referencing a political leader from earth that was in power thousands of years ago. It's very strange really. Star didn't even hear Techno as she stared at the shadow alicorn.Her gaze was full of pure hate. The Star in the capsule stepped back,her eyes wide. "No...no.Y-you can't..."Her eyes filled with anger, and she slammed herself against the glass. "Leave him alone!" He stared at her in amusement. "Oh,but I'm not going to do anything to him." He turned,and smirked at the screen,which was now changing from camera to camera,following the hooded unicorn as he ran down the hallways. "I wonder.He's the only one who knows who you really are.That must mean you care about him.I wonder how much he cares about you..."
The Star in the capsule stepped back,her eyes wide. "No...no.Y-you can't..."Her eyes filled with anger, and she slammed herself against the glass. "Leave him alone!" He stared at her in amusement. "Oh,but I'm not going to do anything to him." He turned,and smirked at the screen,which was now changing from camera to camera,following the hooded unicorn as he ran down the hallways. "I wonder.He's only one who knows who you really are.That must mean you care about him.I wonder how much he cares about you..."
TU: Or that alicorn was the one to reshape your friend? He's then maybe the one who's trying to take over Herobrien's power! TU: Or that alicorn was the one to reshape your friend? He's then maybe the one who's trying to take over Herobrine's power! The black alicorn studied the screen for a moment longer.And then he raised his head. "You're quiet." He turned to see that Star's horn was glowing golden,and getting brighter every second.He shook his head,sighing. "I'm sorry my dear.But I can't let you do that.And it seems he's close enough." He glanced at the screen behind him,before walking over to another machine.Using his magic,he lifted a long cord off the top of it.Star took a step back,her eyes narrowed. "What is that for?" He examined it,before turning back to her.He smiled,baring his teeth at her. "Bait." TU: Yeah I'm guessing that alicorn is trying to summon someone there. It's probably something that's going to target your friend but maybe he's trying to reshape you there. Like he's trying to make you join his side. Star did hear this. ".........He already did that.Several times." Star backed away from the dark alicorn as much as she could while in the capsule. "...And what exactly do you mean by bait?" He walked towards her, still dragging the cord along behind him.He shrugged. "Oh, I don't know.Do you remember that whole necklace thing a while back?" She frowned,confused. "Yes...And?" He used his magic to plug the cord into the capsule.He turned and smiled at her. "Do you remember what happened at the end of that little adventure?" She stared at him for a moment before her eyes widened. "Wait...You mean..." His face turned cold. "Yes.That is what I mean." TU: Yeah this is probably one of that alicorn's attempts to completely reprogram your mind so you join his side. Star pawed the ground sadly. "...Not my mind." Star bared her teeth at the alicorn. "You know it won't do you any good.Whatever you do, in the end it will fail.Or, at the very least, I will come back." He walked back over to the control panel.He waved a hoof towards her,brushing the words off. "Yes,yes I know.The closest I got was that alternate reality.......Anyway." He checked the screen once more. "I suppose that should be close enough." He hit a button with his hoof,and turned to face Star as a machine hummed to life.Black electricity flowed down the cord and towards the capsule. Both Star's braced themselves for what they knew was about to happen. TU: Now I'm guessing this is going to get explosive here. Like it's often followed by an explosion when you get forced to take in dark magic. "It's not dark magic...exactly.It's a special spell for me that he created .Lucky me....Oh,and even luckier.It's amplified by that machine. "Star shook her head, and closed her eyes. Star closed her eyes,and braced herself,even though she knew it wouldn't do anything.She knew immediately when it reached her.Even if she hadn't felt it before,she would still know.How could she not,when it lit her insides on fire?Not literally.Anything would feel better than this.Even that.She brought her hooves under her,tucking her head against her chest.She didn't know what the alicorn was doing.She didn't see him smiling,enjoying her pain. "It's not dark magic...exactly.It'special spell for me that he created .Lucky me....Oh,and even luckier.It'slified by that machine. "Star shook her head, and closed her eyes. TU: yeah if only you had our capes back then to cuddle in! Like you could hide in your cape and nobody would be able to find you for quite a while! Star stared at the memory of herself, thinking. She then turned away from Techno, and faced the wall. Her horn began to glow golden again, and a glowing door appeared in the wall. It looked exactly like the one they had walked through to get to this memory. She stared at it, and then said something to Techno, not turning to look at him. "This is where I leave you. When the memory is done, I will come back, but until then I will stay... outside. I will explain after, but I do not wish to relive this. It... reminds me." She glanced back at the dark alicorn. "This is not the only memory. As I said before, many of my memories are... unpleasant. And I do not want to be reminded of them." She turned back to the door and stepped towards it. TU: Yeah if only I could download your memory into my system. Star stopped and glanced at Techno. "No. You should stay here. I can't 'download' the memory, and I don't want to have to tell you." She then walked fully through the door, and it dissolved behind her. TU: ow whoops! I guess I'll just stick around here then! Like I'll need to see what else there is here so I can understand you better! Though it would be better if I could just directly download your memory though. Star's voice sounded in his head. "Sorry, but I can't download it." Star pressed her hoof against the glass.Her eyes were closed as tight as possible. The black alicorn paced in front of her capsule, glancing at his control panel every so often. He then walked over to the machine generating the spell after checking the screen one last time.He turned it down so that only a few sparks made their way down the cable. He then walked back over to Star. Her eyes were now open, and she only felt a bit of pain every so often. She looked up glaring at him. "What was the point of that?" TU: now this is starting to get rather interesting here! Though I need to snuggle a little more! TU: Now this really is snuggly! The alicorn stayed silent for a moment before replying to Star's question. "The point was to allow my guest to find our location." Her head jerked slightly, but other than that she didn't move. "...You mean Dark? What do you want from him?" The alicorn tilted his head to the side. "Haven't you guessed?Don't you remember what happened with Victor? And all the others?" Star froze, and her illusion spell shattered. Her chest stopped moving, and if anyone was close enough, they would notice that she had no heartbeat.